QuikAllot is a powerful online tool to manage your tasks in a smooth and efficient way. 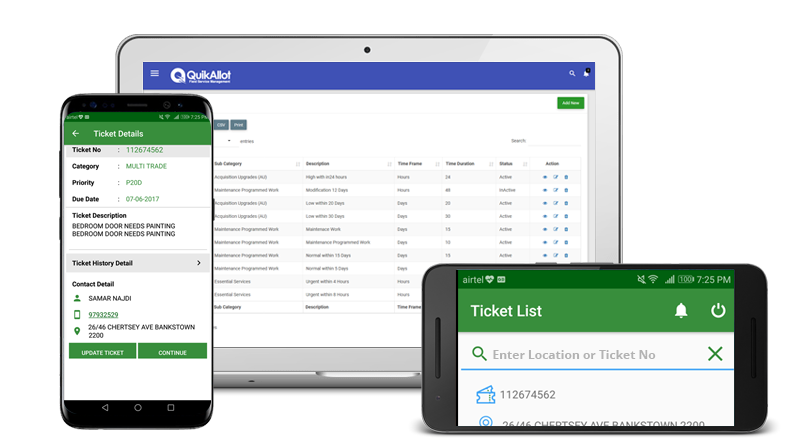 QuikAllot enables impeccable tracking of tasks. No matter the time or place, keeping track of tasks and executives are amply easy with this stellar tool. All of this, in real-time! Keeping records won’t be a hassle. QuikAllot systems are completely digital, saving you a lot of time. From assigning to concluding, all the information is maintained digitally. QuikAllot is designed to ease the process of assigning tasks. With this tool, you will be able to designate tasks to executives with a click of a button. Effortless Task Assigning Power In Your Hands. With the QuikAllot job management software by your side, no task will seem too big. It will save your time, money and offer a peace of mind. Enhancing field service management through proficient features. In the office, or on the field, you get exceptional workflow organization. Real-time updates of on-going work, with the seamless provision of task information. Timely service is delivered always. Immediate deployment of technical executives/workers to ensure quicker solutions. QuikAllot creates tasks automatically through emails. Track time, location and task status on the go. Get live updates about the executive location and task status at all times. Swift and systematic generation of timesheets, leaving out any need for paperwork. Manage Your Tasks With Ease, Get Yourself Our World-Class Solutions. QuikAllot Delivers Terrific Job Management Solutions Across Various Industries To Ensure Stellar Quality!